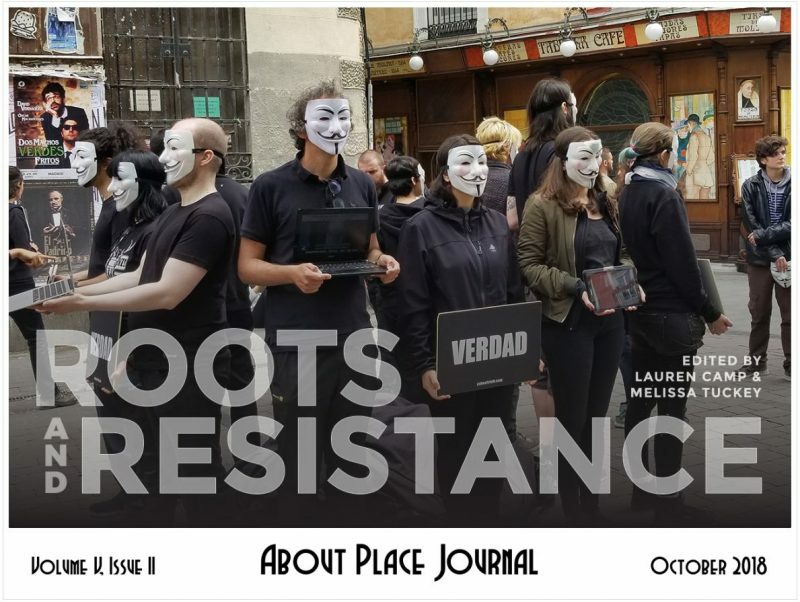 The Black Earth Institute is proud to announce the newest issue from About Place Journal: Roots + Resistance is officially available! BEI publishes the literary journal dedicated to re-forging the links between art and spirit, earth and society. The About Place Journal publishes twice a year and accepts open admissions for each issue. For more information on how to submit your work to About Place Journal. “As artists and writers, part of our task is to pay attention to and distill what is happening around us. In witnessing, we’re called to both lift what is beautiful and name what is unjust, to reclaim language from the powerful and give it back its humanity. For this issue, we were interested in works that get at the root of our current political disaster. We also wanted work that explored and reveled in our sources of support, interconnection, solace, and strength. We wanted work that could be useful to those of us engaged in this challenge who, on many days, feel exhausted, overwhelmed and disheartened. We wanted work that would challenge us to learn from perspectives outside of our own, that would help us understand history and how we arrived at this moment. We received a record number of submissions and were humbled and honored to read all of them. We’ve branched the issue into five root-related sections: Light; Source; Interconnection; Struggle + Adaptation; Regeneration. Each of these include poems, prose, art and other forms of expression. The work we have received reminds us that we all need to nurture ourselves as much as we need to resist the threats to our culture. We need to hold to our strong communities, and also build new ones. Part of our efforts must be a turning back to ancestry and history, to see the germ of a struggle and the start of our futures. We need to look to the past to find the roots of the efforts to amend the present. To view the entire journal, follow this link or click on the About Place Journal tab on the BEI website. Enormous thanks are due to assistant editors Erica Charis-Molling & Katy Richey for offering the first round of opinions on the record number of submissions we received. Collaborating with Melissa Tuckey, especially as we got to the intense final weeks of distilling and organizing, meant numerous and lengthy conversations. We had some shared goals and some places we differed. We brought our life experiences to the submitted pieces, and respectfully argued for the different issues we wanted to be sure to address. Added to this was our self-made challenge of colliding two themes (“Roots” and “Resistance”), which could easily be disparate categories. To choose to work with someone else means both to slow the process and to open it. It’s been a lucky collaboration. I think we did more together than we could have done singly. Overall, we had a common goal: a powerful issue. And we think we’ve got that here. I’m grateful to Katy and Erica who did the first read through and left us careful notes to guide our reading. During the final selections, I learned a lot working with Lauren about my own aesthetic and about hers. We had a nice balance of concerns we brought to the table. We spent many a morning on the phone together, reading works out loud, discussing what we read. This was the best part of collaborating. Editing at this moment in history, I find myself asking—yes, is this useful in some way? Can a landscape exist without any human history or cultural bias attached to it? What are my own biases? How do I do my honest best to look from someone else’s view as I read their work? Our work quickened as we created the sections to organize the work. We ultimately selected the pieces we felt were in conversation with one another. We hope you find the conversation among these works as engaging as we did.